Body boarders have the option of leisurely paddling themselves across open water or tackling the waves for a little more excitement or to perform tricks. It is a great watersport, whether for leisure, excitement, or just to have a great experience with family and friends. To maximize this experience, you will need to find the best bodyboard for your body. This involves things like sizing, as well as considering the shape of the bodyboard and its different features. Below, find some of the top boogie boards, designed to give you a great bodyboarding excursion. You will also find information about what to look for when buying the perfect board at the end of the article. Do not forget to check out our other reviews for great bodyboarding products such as the best bodyboard fins and the best water socks. Fancy a different challenge? Then try your hand at wakesurfing. Need help finding a board? Check out these reviews here. Younger 39 inch Super Bodyboard 60/40 rails allow for more maneuverability and skills. Include Pro Quality leash with wristband to keep board nearby IXPE deck, EPS core, Heat lamination Technology, offers impact strength durability, Lightweight & Rigid. HDPE (High Density Polyethylene) super slick bottom with channels and a crescent tail. California Board Company Switch Bodyboard 36" board offers a smaller scale for lighter riders and has a slick bottom for maximum speed. Ideal for kids, beginners, and groms 5'-2" and under and up to 125 lbs. HDPE high density polyethylene slick bottom skin with channels. If you want to maneuver over large waves or relax as you swim across a pool top, without worrying about the price, this high-quality, durable boogie board will help you have fun. This boogie board is 39”, making it ideal for riders who are between 5’3” and 5’6” and who weight under 115 pounds. However, many adults above this weight have used the bodyboard on waves. The bodyboard is sturdy and lightweight, weighing just 2 pounds and being designed with an IPXE crosslink design and EPS core. Heat lamination is used for superior durability. It has good buoyancy, a 19.5” wide point, and a 60-40 setup to increase maneuverability. A textured grip on top helps maintain your grip, making it great for beginners. It has bottom channels and a crescent tail design. Additionally, there is a foam-lined adjustable wrist strap and a leash that stops you from chasing the board if you fall. This is lightweight and versatile, being appropriate for many riding styles. This is designed to be lightweight and slightly flexible. It has an EPS core and PP foam, with channels on the bottom of the bodyboard. It is designed more for speed than maneuverability, but suits a wide range of bodyboarding styles including dropknee and standing. 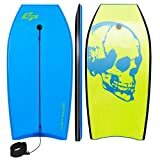 This is a great bodyboard for beginners, especially because it comes with instructions for the board. With these is that advice not to leave the topside exposed to the sun, which can cause it to bubble. You also should not wear body jewelry like rings or take it across shallow waters with rocks, or you may damage the soft foam of the bodyboard. Some cool features are the tethers for swim fins and a bodyboard leash. The board also comes with a 100% manufacturer guarantee for the first year. This rigid bodyboard is great for large riders that want to handle the waves. This is ideal for larger adults or smaller people who want to paddle on calm water. It features an HDPE bottom, EPS core, and IPXE deck that have been sealed using heat lamination. It also features bottom channels, a crescent tail design, and 60-40 rails for better maneuverability. The board also comes with a wristband and leash. The materials used are water resistant and rigid, which makes them great for maneuvering waves. If you are tackling waves with it, however, the bottom plastic may start to peel away after a few seasons of use. This is not for the rough wave rider, but it is ideal for someone looking to have a good time in the pool or on mild waves. This has an EPS core and PP foam, which makes it more maneuverable, but not necessarily faster. It also has features to add to maneuverability and improve speed, including a smooth bottom with rear channels and a crescent tail. The PP foam makes the bodyboard lighter and faster, but it can dent if stored improperly. Some great extra features that come with this include swim fin tethers, a leash, and clear instructions with pictures. The boogieboard also comes with a 12-month warranty. Something else to note is that the heat seal may break if the board is used in heavy waves, causing the inner and outer parts to start splitting apart at the seams. With some companies, you can tell that they care. This great bodyboard is good for adults and children and comes with wonderful customer service. This has an EPS core and uses heat lamination technology to seal everything together. It is designed with bottom channels and a slight crescent tail that is a little less pronounced than you will find on the average board. Its design paired with 60-40 rails make it a good choice for rigidity, speed, and maneuverability. It also comes with a leash and wristband. The downside of this is that it is not as durable as you may like. The design may lighten with time in the sun and the board may be dented by rocks. Fortunately, the customer service is outstanding and they are willing to replace or repair bodyboards you are dissatisfied with. They also check in to be sure the board is delivered on time. This is ideal for beginners who may prefer speed over maneuverability because of the slick outer coating. This is a bodyboard that is incredibly lightweight, so it is highly advised that you choose the size based on weight requirements. The deck is made of cross linked polyethylene, while the bottom is made of XPE. This has a sleek outer coating that makes the board faster. Unfortunately, it can be a little rough on some people’s skin, so you may want to wear a t-shirt while riding if it irritates you. Though the board comes with a leash, it is of poor quality and the cord is rather short. It has a crescent tail and while it is not the best for handling large waves, it does make the perfect boarding companion for a beginner to the sport. If you want to wipe out on the sandbar, this is for you. It can handle big waves and wipeouts, making it great for everyone from beginners to experts. This has good speed, maneuverability, and control. The HDPE slick bottom lets you ride in varying degrees of waves and the board features rear channels and a 60-40 design. It also has an EPS core that makes it lightweight, buoyant, and durable. The one exception to durability is the black strip that goes around the outside, which may start to separate after wear and tear. This comes with a leash, which makes it safe for riding in wavy conditions. The same bodyboard is very versatile, being able to be used by kids and adults. If you want to lie on your bodyboard in comfort, this molded contour deck will provide a superior, comfortable riding experience. This is packed with features to keep you secure and comfortable. It features a molded contour deck, arm wells that help hold you in position, and thumb bulbs to improve your grip. It also comes with a sturdy coil leash that pivots to reduce kinks. One downside of the leash is that it comes taped to the board, which can damage the graphics when the tape is removed. The boogie board is constructed with and EPS waterproof core and HPDE bottom that has channels to increase speed. It also has a crescent tail. Though it does not have a stringer, the core is strong enough to ride dropknee style without damage. The board does run a little big, however, and there is no way to select the color you receive. The bodyboard that you choose is going to have a huge effect on the amount of enjoyment that you can have in the water. You want to choose a board that fits well with your bodyboarding style, as well as your body. This is especially true since you will probably use the same board for years to come. If you choose a bodyboard that is too small, your body is going to drag behind in the water. If the bodyboard is too large, you will not be able to control it as well. You should choose a bodyboard based on the length of your body. Measure the distance between your belly button and the ground. Then, measure the distance between your chin and knees. If the numbers are more than a few inches apart, use the average to direct you to the right sized board. You can hold the board before buying it, then you can see if your fingers curl around it when you hold the bodyboard under your armpit. If so, then you have probably chosen a good boogie board size for your body. Another technique that you can pick out to get the size of the board involves using your height and weight to choose a boogie board. Here is a useful boogie board sizing chart that you can use. While you should consider your body size to find the perfect body board, you should also consider the waves that you will be handling (if any). If you plan on using smaller waves, then a larger bodyboard will help you navigate them better. If you want to ride large waves, then you can maximize maneuverability and control by using a smaller board. Bodyboards are typically made of either polyethylene (PE) foam or polypropylene (PP) foam. Older boards are commonly made of PE foam. Though they are generally more affordable, PP boards are considered higher quality. They are stronger and lighter, without sacrificing stiffness or weight. The other option is a board that combines PP and PE foam. The two materials are layered to create the board, which lets companies sell better performing bodyboards at a lower cost. An expanded polystyrene (EPS) core is another choice. This is commonly seen on beginner boogie boards because it is lightweight, but buoyant with a little flexibility. Something else to consider regarding materials is what is called a ‘stringer’ design. Bodyboards with a stringer have a tube made of fiberglass or carbon fiber that runs the length of the board. This increases flexibility and strength of the board. It does improve durability, but it also increases the overall cost of the board. The bottom of the board is usually constructed of either high-density polyethylene (HDPE) or surlyn. HDPE crease more easily, but they are generally more affordable. Surlyn uses a polymer plastic, usually the same variety used to create the cover of a golf ball. This material is much harder and less likely to crease or be damaged. Skin describes the foam that covers the rails and deck of the boogie board. It is usually made of polyethylene (PE) or crosslink. PE foam works well as a skin, as it does as a core material. It is lightweight, buoyant, and stiff. Crosslink is denser than PE foam and has a smoother, harder finish. It does not have as much ‘spring’, however, so it will not hold its shape as well and may develop wrinkles over time. The shape of a boogie board will affect the best way to ride it. The most common type of board is called ‘prone’. The prone board has a wide point that is farther down on the board, which is ideal for riders that lie down as they are riding through the waves. Another common shape is the dropknee bodyboard, which has a wide point that is near the middle of the board or lower. This is designed for more experienced riders, who ride with their knee on the board rather than their body. This stance keeps their weight further on the back of the board, so the lower wide point helps maintain balance. Finally, combo or versatile boards are designed to use either a prone or dropknee stance. These are ideal for people who plan on advancing their skills or doing tricks once they have mastered the basics, especially if you do not want to buy a new board. There are many terms that you will hear in relation to bodyboarding and not all of them will make sense if you are not an expert. The key to finding a perfect board is in understanding these terms and what they mean in relation to the board, so this section will break that information down for you. The rail typically describes the outer edge of the board, though some people will refer to the top edge as the ‘chine’ and the bottom edge as the ‘rail’. What matters is the configuration, which will be either 60-40 or 50-50. The 60-40 configuration increases maneuverability and control, while the 50-50 option lets you board at higher speeds. The tail of the board describes the design at the end of the board. The most commonly used boards have either a crescent tail or a bat tail. Crescent tails are common on many older boards, since the bat tail is a newer feature. It has an inward curvature and is known for increasing the speed of the board and providing more stability than a bat tail. The exception to stability is for heavier riders, who might benefit from the bat tail. This is because the bat tail lifts the back of the board more than a crescent tail, which increases speed for larger riders. The newer-designed bat tail is ideal for riders with experience as well. It can be used to improve control and lets riders do tricks when they are on smaller waves. As the name suggests, the wide point is the widest point on the board from the rail on one side to the other. The width of the board heavily effects how buoyant the board is, as wider boards will have greater buoyancy. The downside is that with increased buoyancy comes less maneuverability. As the attitude of bodyboarders has shifted to a desire for increased maneuverability for wave riding, manufacturers have started to create narrower boards. The position of the wide point in relation to the nose also affects the boogieboarding experience. Those with a wide point farther back toward the middle of the board will increase maneuverability, while a wide point toward the nose of the board increases stability. The most common thicknesses for bodyboards include 51 mm and 55 mm. The thinner style of boards are a little slower and do not offer as much stability on the water, but they do offer superior control for people who want to perform tricks. The thicker boards are faster, but they are not as easy to maneuver through the water. For this reason, thicker boards are ideal for people who want to ride small waves. Some boogie boards are flat, while others have an upward curvature toward the nose of the board. The boards with the curvature are known as rocker bodyboards. The curve affects maneuverability—a bigger curve gives you better control over waves. However, these boards are notably slower than boards with a smaller curve. The best boogieboard for beginners will have less rocker. Choose something with a small curvature or go with something completely flat, at least until you get the feel of the board. Finger bulbs/hand bulbs- Finger bulbs describe raised bumps on the bottom of the bodyboard, while hand bulbs describe raised bumps on the top corners of the board. These are designed to give you a surface to grip onto, to improve your grip on the board so you do not slip. They are very useful, especially for beginners. Hand wells- Hand wells are indents found near the nose of the board. They improve grip by giving your hand somewhere to rest. Elbow locks/pads- This area is a contouring of the board where you can rest your elbows and hold them in place while you are paddling. Hip channels- These help hold your body to the boogie board. They are slight depressions that can be found near the tail end of the deck. Bottom channels- Bottom channels increase control while you ride on your boogie board. They are areas that have been gouged out on the bottom of the board, which helps direct the flow of water as it flows off the tail end of the board. Bodyboarding is an incredibly fun sport for those who want to learn. It is also incredibly versatile—you can stick to the small waves or head for the larger ones with a dropknee style or learn to do tricks. Regardless, it is a great way to stay physically fit, enjoy the water, and experience the great outdoors. With any hope, this article has helped guide you in finding the perfect boogie board for your outdoor enjoyment.